The Kubota pendulum spreader is the first choice wherever the demand is for maximum spreading quality and ease of operation. 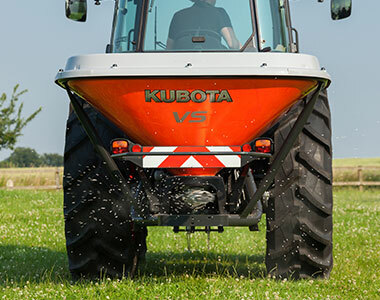 With hopper capacities of 600, 800 and 1000 with the 600 hopper as a basic hopper and 750, 950, 1150, 1350 and 1650 litres with the 750 as a basic hopper, Kubota is offering you a wide range of different models and hopper capacities. Spreading along field edges and tram line border spreading is no problem at all-thanks to the border spreading plate and the tiltable headstock.